Let me explain: Brussels sprouts are not only a member of the cabbage family but are the same genus and species as cabbage, as are broccoli, cauliflower, kohlrabi, and kale. Differences in these plants lie in the way growth of the stems and leaves are expressed. Cabbage has a single stem that’s been telescoped down to very short internodes, resulting in a tight head of overlapping leaves. With kale, internodes along the stem are further apart, allowing each leaf to unfold fully on its own. They also look different from those of cabbage. In every plant, a shoot bud develops in the upper part of the crotch where a leaf joins a stem. 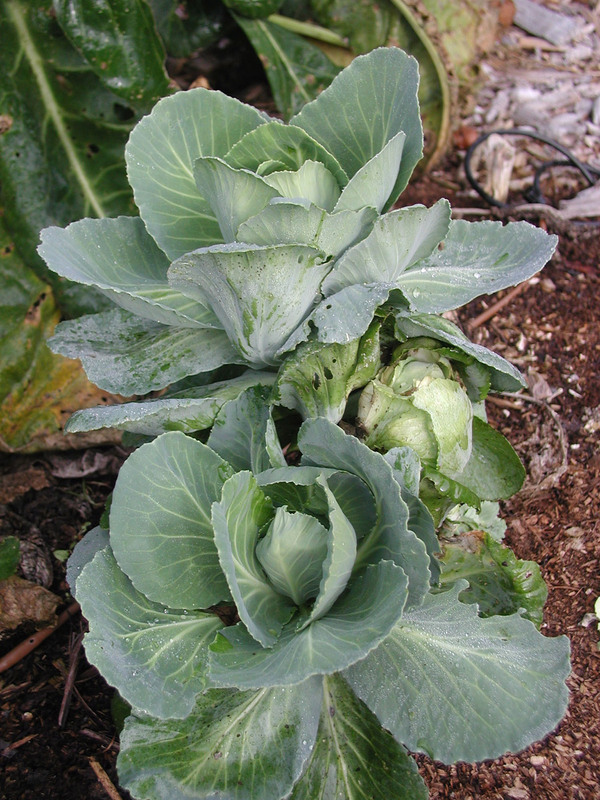 Most brussels sprouts buds each start to develop enough to form a small, cabbage like head. But I — and probably you also — want large brussels sprouts sprouts (and more of them, so I also want tall brussels sprouts plants on which to attach the sprouts). The sprouts are retarded somewhat in their development by a hormone called auxin. Auxin is one of many plant hormones coursing about within leaves, fruits, shoots, and roots, their effect dependent on such variables as plant part, plant age, and what other hormones they are reacting with. One place of auxin synthesis is in the tips of stems, and their effect is to suppress growth of buds down along the stem, with more suppression the closer a bud is to the tip of the stem. 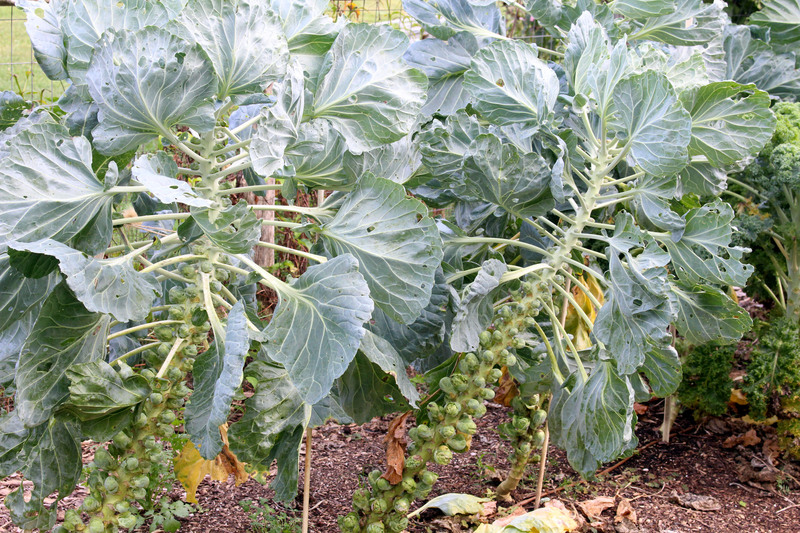 I just looked at my brussels sprouts plants; yes, the largest sprouts are those nearest ground level. It’s still too early to harvest and too many of the upper sprouts, at present, are too small to be worth picking. Suppressing auxin production in the tip of the stem releases their hold on the buds — that is, the sprouts — along the stem, so they can grow larger. Suppressing auxin production is simple, requiring only two fingers: Just snap off the tip of the stem. No tip, no auxin production, for a while, at least. The time to do this “operation” is the beginning of September. Done too soon, and a developing sprout might grow so bold as to grow out into, at worst, shoots or, less worse, loose heads. Plus, earlier in the season, I want to keep the stem elongating to provide real estate along which to hang more sprouts. As I wrote, every plant develops buds in its leaf axils, and in every plant growth of those buds is mediated, in part, by auxin. Harvest the main head of broccoli and side shoots start to grow for eventual harvest. Even tight heads of cabbage have those buds and they also respond to auxin’s influence. I used to plant cabbage in the spring for harvest in summer. Rather than pulling out the spent cabbage plants, as is usually done, I would leave the cut stump with a few bottom leaves for nourishment. Harvesting the cabbage dramatically removes the tip of the stem, which was buried within the head. Within a couple of weeks, new sprouts would develop in the crotches where leaves were or had been. In the ideal world, I’d get one to three new cabbage heads from each plant, ready for autumn harvest. A certain amount of art was needed to get it right. Depending on growing conditions and the number of new heads I allowed to develop, they might end up too small or too loose-leaved. I’ve abandoned that chancy cabbage habit and now do a second sowing of cabbage in early June for a reliable autumn harvest of firm heads. I fiddled around with hormones earlier this season also, with longer term goals in mind. Auxin keeps the tip of a stem or the upper portions of a plant growing most vigorously. Vigorous growth, though, is at odds with making fruit. After all, both require a lot of a plant’s energy, so the plant has to partition the energy efficiently between growing and fruiting. Fruits now dangle from some of the stems that I pulled down a year ago last spring. The response can take more than a year as energy reserves are redistributed within the stem. 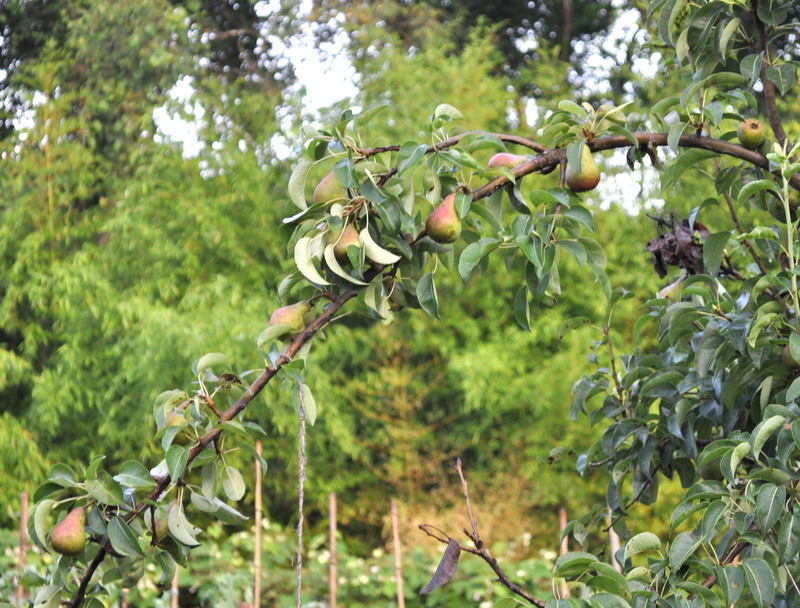 Response also depends on a tree’s inherent vigor, growing conditions for the season, the pear variety, the degree of stem bending, and other knowns and unknowns. It’s takes a mix of science, art, and experience, and that’s what makes gardening so interesting for me. This entry was posted in Books, Fruit, Gardening, Vegetables and tagged auxin, brussels sprouts, cabbage, hormones, pears, testosterone. Bookmark the permalink. Trackbacks are closed, but you can post a comment. Genius! When I think of auxin I always think of tree leaders but to use it to your advantage? I will be visiting my brussels today in the garden. I think I will experiment with a few – thank you! I have a very old pear tree, close to 60 Plus years. But the fruit is extremely hard. Even after it is picked, it stays hard. A person told me it was a HOG pear tree. Is there such a thing? What type of pear could it be? Do you mean a “hog” pear, as in one fit only for pigs? Many wild seedling would be in that category. Try picking it according to the same measures I mentioned in the blog, then, if it’s an early ripening variety, chill it for a few weeks before taking it out of the the refrigerator to soften just a bit a room temperature. If it’s still inedible, admire the tree for its beauty, cut it down, or graft it over to a tasty variety or two. Keep me posted. I don’t mean to be dense, but when you say pinch of the top of the stem are you talking about the leaf? I’m new to growing brussell sprouts, but want to make sure I do it right! Also, I think I planted mine to close together. Is this going to be a problem? Also, it looks like I may have planted them the wrong time of year, but my local nursery was selling them and they usually only sell things when they are meant to be planted. I’m in Texas, by the way. “Pinch” means to just nip out the growing point. No matter if you take a few leaves with it. Too close: Yes, that could be a problem. They need at least 18″ between each other. If closer, consider taking out some in between. You could plant lettuce, spinach, radishes or some other quick-maturing vegetable there. As far as time of year, if you’re in a mild winter area, the usual time to plant cool weather vegetables would be in early fall.